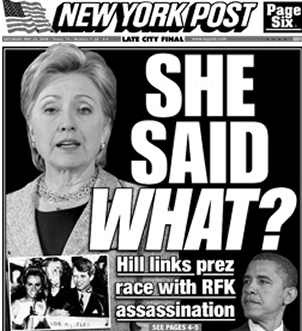 Hillary Rodham Clinton let the political assassination meme out of the bottle! She unconsciously or consciously said she is staying in the presidential race just in case something happens. The copycat factor is a reality underlying assassinations, and she did the unthinkable. As Michael Goodwin of the New York Daily News straightforwardly wrote: "Hillary Clinton is staying in the race in the event some nut kills Barack Obama....We have seen an X-ray of a very dark soul." One can be liberal or conservative, left, right, or middle, Drudge Report reader or Nation subscriber, and "get it." The outrage was widespread, and yet the only person that seemed unaware of the depth of feelings was Senator Hillary Clinton. What has been revealed in this one event speaks volumes. What was she thinking, indeed? I don't. Because again, I've been around long enough. You know, my husband did not wrap up the nomination in 1992 until he won the California primary somewhere in the middle of June, right? 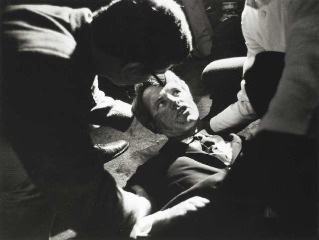 We all remember Bobby Kennedy was assassinated in June in California. You know, I just don't understand it. You know, there's lots of speculation about why it is. Hillary Clinton, May 23, 2008. She actually said those words. You actually invoked the nightmare of political assassination. You actually invoked the specter of an inspirational leader, at the seeming moment of triumph, for himself and a battered nation yearning to breathe free, silenced forever. You actually used the word "assassination" in the middle of a campaign with a loud undertone of racial hatred - and gender hatred - and political hatred. You actually used the word "assassination" in a time when there is a fear, unspoken but vivid and terrible, that our again-troubled land and fractured political landscape might target a black man running for president. You actually used those words, in this America, Senator, while running against an African-American against whom the death threats started the moment he declared his campaign? You actually used those words, in this America, Senator, while running to break your "greatest glass ceiling" and claiming there are people who would do anything to stop you? This is unforgivable, because this nation's deepest shame, its most enduring horror, its most terrifying legacy, is political assassination. Countdown with Keith Olbermann, May 23, 2008. The power of words, the power of the media, and the power of graphic imagery cannot be underestimated in this political year, or any year. The fact that the vulnerable homicidal-suicidal mind of an assassin can and has been influenced by behavior contagion and the copycat effect cannot be disputed by anyone who is a student of assassinations. Indeed, what was Hillary Clinton thinking? Her non-apology "apology" only has made this worse, and I predict will fester like an unhealed wound until she steps aside. Despite what she said in her "apology," she has not honored RFK's New York Senate seat with her actions of late. She little realizes the power of her own words if she allows this to continue, and sit there, waiting to further infect the nation, as we move closer to the 40th anniversary of the assassination of Robert F. Kennedy. Clinton will not be to blame, needless to say, if a politician is assassinated or an attempt occurs during this campaign year, but to reinforce the climate of instability with these words is beyond belief. If Hillary Clinton is steeped in history, then she surely realizes that an African American man, Martin Luther King, was assassinated a mere two months before Robert Kennedy was assassinated. The meme was there in 1968. That meme happened almost exactly 40 years ago. Actions are followed by actions. Why give this such an contoured focus in 2008? Is Hillary Clinton truly a student of history or does she wish to make a mockery of it? 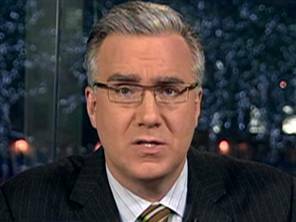 As it turns out, we were left to the Drudge Report and Keith Olbermann to serve as strange bedfellows, the united emotional voices in this nation to speak for most of us about how horrible her words really are. Was she thinking that, indeed, Obama would be killed, and thus she wanted to be waiting in the wings? How can she look at herself in the mirror and stay in this race any longer? A 18-year-old Connecticut man has died after apparently dousing himself with gasoline and setting fire to himself, according to a Maine Department of Public Safety statement. Two motorists found Alex Whitney, Tuesday night, May 20, 2008, sitting in the middle of Duck Pond Road in Ellsworth, Maine. A can of gasoline and a lighter were found nearby. Whitney, a student at the University of Maine in Orono, was taken for treatment to Brigham and Women's Hospital in Boston where he was flown by helicopter overnight. He was receiving treatment for burns on more than 60 percent of his body, before he passed away due to his injuries. The fire burned more than two acres of woods. The State Fire Marshal's Office has impounded Whitney's car, which was found nearby at the fire scene, according to McCausland. Investigators plan to examine the vehicle "to try and find out why he did this bizarre act," McCausland said. Joe Carr, director of university relations at University of Maine, said Wednesday that Whitney was a freshman forestry student who had been staying on Mount Desert Island as part of a UM program. Each spring, first-year forestry students spend two weeks studying and working in Acadia National Park as part of the school's forestry studies, he said. Counselors went to MDI to offer their services to Whitney's fellow forestry students. "They going to visit them directly," Carr said. Dr. Robert Dana, UMaine’s dean of students, said Wednesday that Whitney was an Eagle Scout, a big UMaine hockey fan and a member of the Tau Kappa Epsilon fraternity. He said Whitney also enjoyed playing guitar. Whitney was a 2007 graduate of St. Paul Catholic High School in Bristol, Connecticut, and was studying forestry. Whitney and his fellow first-year forestry students had just started a two-week program at Acadia National Park. The voluntary trip sends students into the sprawling park to repair roads and infrastructure and work in the forest, Dana said. "It's on-the-job training as well as a bonding experience" for the freshmen, he said. Whitney arrived at Acadia sometime over the weekend, Dana said. But at some point, he left and drove to Ellsworth. "The death of a child and person is always indescribable," Dana said. "Communities like this are always devastated." Dana described Whitney as a "friendly, quiet young man" who had attained the rank of Eagle Scout. Whitney's Eagle Scout project involved the restoration of a section of the trail in Unionville's Suburban Park. On Dec. 14, 2004, the Farmington Town Council declared it "Alexander J. Whitney Day" in honor of his efforts. "As a result of Alexander J. Whitney's work, the experience of the citizens of Farmington who use Suburban Park will be forever enriched and enhanced," the proclamation states. When discovered on fire, Whitney spoke to the two individuals who found him, indicating his was intentional act. 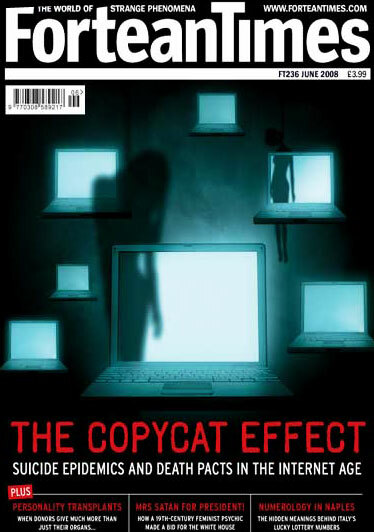 This spring Fortean Times highlights "The Copycat Effect - Suicide epidemics and death pacts in the Internet age." This month, in the wake of the recent suicides of young people from Bridgend, South Wales, Jack Sargeant wonders whether some kind of "copycat effect" might be so powerful that it could induce people to end their own lives, while Loren Coleman examines the anatomy of a suicide cluster and Chris Kimberley listens to "Gloomy Sunday", a song supposedly responsible for a rash of self-killings in pre-war Hungary and beyond. On sale from 1 May 2008 (in the UK), later elsewhere. All was not truly quiet. Although no classic fatal school shooting outbreaks occurred during 2008's red zone temporal window at North American schools and universities, other events did transpire. The following is a summary of various incidents. The media published several articles reviewing the Virginia Tech shootings of April 16, 2007. A bit less so, mentions were made of the shootings at Columbine, in which 15 people were killed, on April 20, 1999. 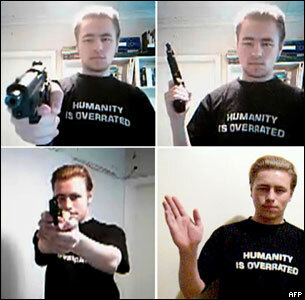 Several news items detailed the public sections of the final report released April 17, 2008, about Finnish school shooter Pekka-Eric Auvinen, seen above from a video he posted online. Auvinen shot and killed eight people and himself at a Jokela, Finland school, in November 2007. In copycat fashion, he planned the attack for months, wanting to create "massive destruction and chaos," police said. Among Auvinen's ten Web contacts was U.S. teenager Dillon Cossey, who was sentenced last year to up to seven years in a juvenile facility after admitting he had a plan to attack his school near Philadelphia. The two teens communicated online about the 1999 Columbine school massacre in Colorado, and exchanged videos they found on the Internet. On April 28, 2008, Wesley Johnson, a 27-year-old auto mechanics student, was charged with two counts of assault with intent to kill, two counts of carjacking and assault on a police officer after opening fire at a vocational school, the Excel Institute, in Washington D.C. He had been a former student of the school. Witnesses said the gunman -- wearing a black suit and a fedora -- walked through the Excel campus in the 2800 block of V Street and spoke to some students before going into a building and suddenly opening fire. A male student was the first hit. Teacher Curtis Hochman found himself in the crosshairs next. The gunman pointed the pistol at Hochman's head and pulled the trigger. But it jammed, sparing the teacher's life. A woman outside the school, a visitor, became the next victim. She was shot in the shoulder as the gunman walked out. Both victims are expected to survive. Police said the gunman carjacked two vehicles as he fled. One carjacked vehicle hit a police cruiser and another car, injuring an officer and a pregnant woman. Officers then caught the suspect and arrested him. Police searched Johnson's Fort Washington, Md., home Tuesday night, April 28th. Sources said they found ammunition and writings on the wall about Judgment Day. Several other threats and arrests did occur around the anniversaries of Columbine and VA Tech. But it appears students, parents, educators, and law enforcement personnel worked together to prevent any major incidents in 2008. In February 2008, 64-year-old Joe Parks, who has taught education at Fresno State for 10 years, allegedly said he would cause a school shooting of his own. California State University, Fresno is investigating allegations by two students that this tenured professor threatened to bring a gun to class and start shooting. The school has suspended Parks. A student said in a police report that during a discussion of a school shooting, Parks said he wished he could bring his gun to class and "shoot all of you." Parks denies making that statement during a teacher-preparation class in February, but concedes that he tends to be controversial in his remarks. A 15-year-old Springboro girl Springboro (Ohio) High School officials accused of saying on April 17, 2008, "I feel like shooting all the jocks and hanging all the preps" has been transferred to Kettering Youth Services. The girl was transferred on Tuesday, April 22, according to court records, a day before juvenile authorities in Warren County were scheduled to reconsider her detention. Officials said she uttered the threat in the cafeteria April 17 at Springboro High School. On April 17, the school district issued a statement, assuring parents and students that school would be safe the next day. Students were sent home early Thursday, April 17, 2008, from a high school in Hacienda Heights, California, and the school was closed Friday, April 18, due to rumors of a school shooting planned there. Los Angeles police arrested on Friday, April 18, a high school student who posted warnings of a school shooting to happen at Glen A. Wilson High School in Hacienda Heights of Los Angeles, prompting authorities to close the school. The incident began Wednesday evening, April 16, when Los Angeles County sheriff's officials notified Hacienda La Puente Unified School District police that a threat against students at Wilson High had been posted on the district's Wikipedia entry. The entry read: "This is a warning. Do not remove this from this page. On Friday, April 18, 2008, there will be a shooting at this school. Current list of victims to be shot on this day: . . ." The student was arrested. An unidentified South Bend, Indiana, teen was arrested April 19, 2008, after a school officer investigating an unrelated threat at Penn High School (near South Bend) discovered Internet postings in which the teen allegedly discussed his support for the Columbine attack. Authorities said the boy and an Ohio man exchanged e-mails and discussed mass murders at Penn High and another location. Early in May 2008, Lee Billi, 33, of the Cleveland suburb of Lakewood pleaded not guilty to conspiracy to commit murder. Columbine-style shootings were threatened in graffiti at Prairie High School, Vancouver, Washington, on April 21, 2008. All was calm as the day passed. A Hyde Park, Ohio, man was credited with stopping a potential school shooting in Canada. On Monday, April 21, 2008, the 20-year-old who wishes to only identify himself as Jason found a website with a posting that contained a threatening message that included a picture of a mask with two guns and ammunition. With the anniversary of Columbine on his mind, Jason notified Cincinnati Police. It turns out the threat was against one of Montreal's Vieux Montreal college. As a result, officers shut down all classes and activities for the day. Back in 2006, a gunman opened fire on students at a Montreal's Dawson College, killing one and injuring 20. Through investigative work, Montreal police tracked down a 16-year-old suspect who had ammunition inside his home; he is in custody and faces charges. Parents were notified Tuesday, April 22, 2008, that their child was on a hit list, after it was uncovered at Hayfield Secondary School in Fairfax County, Virginia. Fairfax County School officials did not say how many kids were on the list and what, if any, disciplinary action was taken, as the list maker was identified by authorities. No injuries occurred. On April 24, 2008, a 14 year old boy was arrested for sending e-mails to a female classmate that threatened a shooting at West Valley Junior High in Yakima, Washington State. According to police, the boy claimed he was going to bring a gun to school on April 25. However, the boy stayed home from school and police said they do not believe he posed a threat to the girl or any of his classmates. The boy is being charged with felony harrassment and is being held at the Yakima County Juvenile Detention Center. In Alabama, around this time, a Floyd County parent contacted the police department about a school shooting threat against Coosa Middle School. One subject told police the suspect said he wanted to re-enact Columbine. Police went to the home of the suspect and conducted a consent search of the residence and found several articles associated with the Columbine shooting that had been printed off of the internet. The juvenile was arrested, and in early May 2008, was at the Youth Detention Center in Rome. On May 9, 2008, a threatened Minico High School, Rupert, Idaho, school shooting event never happened, and the Minidoka County Sheriff's Office arrested the student who made the threat. The sheriff monitored the school because the student allegedly had threatened a massive school shooting.